West Bengal rich tradition of Handloom Weaving. It is a part of its cultural heritage. The textile products of Bengal have attracted not only national but also worldwide attention and bears the timeless legacy of our cultural heritage. ‘Jamdani’ and ‘Tangail’ are two pioneer sarees in the filed of heritage handloom products of Bengal handloom. 'Jamdani' - the great characteristic of fine art in hand weaving derived from a "PERSION" word 'JAM' meaning a 'cup' and 'DANI' denotes the 'container' . Jamdani style of weaving flourished under the benign, rich and enlightened patronage of kings and emperors. It may be considered as a textile of excellence for its super fine qualities in the fifteenth & sixteenth centuries. Excellence in weaving lies in the virtuosity of forms drawn from the social, religious and natural environment and translated through a particular technique and the weaver's sensitivity to create a new art form. 'Tangail' was originated from Tangail, a district of present Bengladesh. Previously it was named as "Begum Bahar" where silk warp and cotton weft were used. Later on, both cotton warp and weft were in vogue. The weaver mainly of 'BASAK' community who migrated from Tangail district before partition of our country & settled in 'Katwa' Dhatrigram, Tamaghata, Samudragarh, area in Burdwan district. At present, silk Tangail sarees have been revived. The technique of drawing and weaving of extra weft for figured Tangail sarees is more or less identical to Jamdani sarees. Unlike Jamdani, two plain picks instead of a single pick are inserted after each extra weft meant for figured design. 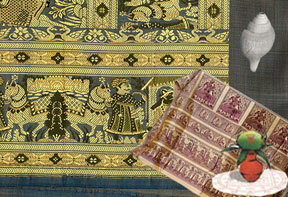 Silks of Bengal were much acclaimed the world over since ancient times. The most well known Bengal silk saree which carry its popular name is Baluchari saree - a production of exclusive design and fabulous weaving technique. A revival in recent time of both the Baluchari and another out standing traditional Bengal saree - "Daccai" has lead to nation wide and world wide popularity and interest in Bengal silks. Like silks cotton sarees are also woven in a fascinating and exquisite range. The Daccai Jamdani is a fabric on which designs are raised in inimitable style. Handloom still remains the great employer of rural sector in Bengal. 3.5 lakhs handlooms exists in West Bengal till date. Santipur, Fulia in Nadia district, Dhaniakhali, Begampur in Hooghly district, Samudragarh, Dhatrigram, Katwa, Ketugram in Burdwan district, Bishnupur in Bankura district are the mainly handloom concentrated areas in the state of West Bengal.